Fresh step cat litter created by Clorox, comes in several different types of litter. They have clay, crystals, scented, unscented, scoopable, extreme odor control and cat litter for multi-cat households. Fresh Step litters contain carbon, which works to eliminate odor, meanwhile their crystals are created to immediately absorb wetness. For this review we will be sharing our experience with both the multi-cat litter and the crystals. Fresh Step multi cat litter comes in several sizes, 14lb, 20lb, 25lb and 42 lb, ranging from $9.99 to $19.99 in price. The first thing we liked about this litter is that it clumps, which therefore makes it much easier to scoop and keep the litter box clean. We also loved how easy it is to find, we were actually able to buy it at our local grocery store meanwhile grocery shopping, we usually have to make a special trip to the pet store for our other cat litters. The price was reasonable; it was actually a bit cheaper than our silica crystals, so no complaints with the price. We did find this litter to be a bit dusty, when I poured the litter into the litter box there was a small cloud of smoke. Keep in mind that we are used to silica crystals which are completely dust free. Once the litter was laying innocently in our litter box, I smelt a light scent of fragrance , my husband said he didn’t really smell anything, however this immediately made me nervous that our cats with their sensitive noses wouldn’t use the litter. Well I was wrong, they both used the cat litter with no problem, so I guess the scent was light enough not to bother them. Now concerning the odor control, which is a very important part of determining if a litter is worth your money, the odor control was very impressive. The odor control was much stronger than I expected, I guess that flowery scent I smelt really does it’s job of covering up the odor. There was some tracking, but less than we expected, we did have to use our trusty dirt devil, but when you’ve used crystals you get used to sweeping or vaccuming up litter. 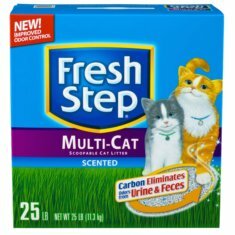 Overall, other than the initial dust and the scent which only seemed to bother my nose, fresh step cat litter did a good job of covering up the odor, the price was reasonable and our cats used it without any problems. We bought the Fresh step cat litter crystals 8lb bag for about $25, it was a little bit more expensive that our regular silica crystals which we get at Wal-Mart for $20. It worked just like any other silica, there was no dust, as expected, good odor control and it absorbs well. If you’re a fan of silica crystals, then you will like this brand. Silica crystals are generally a bit more expensive than other types of litter, but we’re big fans of the dust free, odor free features of crystals. Crystals do not clump, but it’s still easy to scoop any cat litter box with basically any scooper. However when using silica cat litter, you will need to keep your broom very close. Out of a possible five paw print we give this product three. 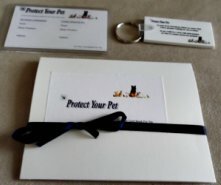 Three paw prints means that this product is a good product that we like. Although we found the multi-cat litter to be a litter dusty, and there was some tracking, we loved the odor control and the clumping that this litter offered, we also found that the crystals didn't dissappoint and was also great at odor control and great at absorbing any wetness. Where Can You Buy Fresh Step Cat Litter? Feline Pine Review - Detailed review of Feline Pine Cat Litter. 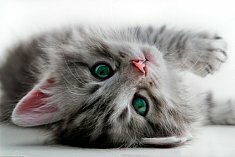 Litter Box Training Made Simple - Step by step instructions on how to teach your kitten or older cat to use their cat litter box. 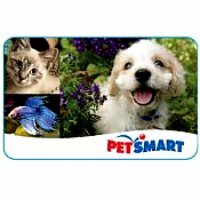 Self Cleaning Litter Box Reviews - Reviewing several different self cleaning litter boxes to find out which ones work best.